Catriona is a multidisciplinary artist who thrives on cross cultural exchanges and projects that are site specific. Why did you apply for the Coordinator position originally? Was it what you expected? I was interested in the experience of running an artist run initiative in the central desert after the recommendation by the previous coordinator Cath Bowdler. How did you find working at WTS? Was it different from arts organisations you had/have since worked for? It was extremely stimulating, deeply engaging and completely exhausting! What were some of your fondest memories at WTS? The artist camp I ran with Joy Hardman at 2 Mile Waterhole, running a video projection night at the Old Drive In and hosting German artist Renate Anger . Tell us about your greatest achievements during your time as the Coordinator. Conceiving of OUTSITE, an annual site specific event located in the Alice Springs Desert Park and securing the funding for the inaugural event. I was also successful in increasing the organisations funding by 50%. In your eyes, what makes WTS an important organisation? This organisation works across so many different cultural bodies and practitioners of the wider Alice Springs region while also connecting local audiences with artists from across the nation and beyond. It is a cultural hub that plays a vital role in the arts for the Northern Territory. Where are you now: geographically, work-wise, life-wise? Has WTS contributed to where you are now? Definitely. It enabled me to gain skills in curating, writing grant applications, managing a gallery and networking with artists, cultural organisations and communities. Eat drink and jive, for Watch this Space is now twenty five! Beth is a current WTS studio artist, Board member, general arts babe, and recent Masters graduate in Community Cultural Development from VCA. "Well I like to have a go at nearly every medium sooner or later. I guess I’m driven by ideas rather than materials but I also love materials and form and I specially love working with colours. I also mostly am interested in working socially – with people, both other artists and ppl from other fields and experiences. This seems to me to be the most effective way to work with what we learn as artists about seeing the world in order to ‘rearrange desire’ (as Gayatri Spivak puts it)." At the time I had just kind of broken as a result of caring too much about a project with Pitjantjatjara people that didn’t work out. I realised that I cared more than my collaborators did about that particular thing which was trying to bring the first female fronted band to bush bands bash which had always been male dominated. It wasn’t a big thing itself but was the final straw after a long period of being very invested and maybe not having adequate frameworks in place to think through our place here. And so when I broke I realised I needed a break from working so intensely inter-culturally. But I didn’t want to leave Alice and art was all I really knew about. I remember I was crying on my bed and I saw on facebook that the job was being advertised and it felt like fate was calling. Working at WTS was pretty lonely back then. I felt like I spent all year trying to create alluring things that would bring more people to events and exhibitions and into collaboration and it sometimes worked but then the inbetween times were very isolating. Although Dan and Lucy and Kevin and some other people were great support as much as they could be then. WTS is much smaller than other orgs I’ve worked for but this offers a kind of freedom and dexterity which is exciting. Well my memories of the space stretch well beyond just when I worked there. So many parties and shows and encounters from before that time and since. Getting people to hump some soft sculptures I made in a tent as part of Free BBQ cash giveaway springs to mind. It was really special getting to work with Pam Lofts on her last show there when I worked there in 2011. Making one of those science experiment baking soda cakes with Jennifer Mills on the floor in maybe 2008 but I can’t remember why? Hoaxing ppl with my ‘Sorry Souvenir Phenomenon’ work. Sorry not sorry. Ummmm soo many peoples creative work over the years. Zine fairs. Hmmm it definitely wasn’t reconciling MYOB accounts. I’m thinking about the sock puppet night and blindfolded dinner, and the Souvenir group show I co-curated with Franca and also Font Love with Jeff, and maybe planting the seeds for Artist Wants a Life which was difficult in some ways as it turned out but still fostered lots of collaborations and relationships which are enduring. Most things that bring artists together are usually rich in this way, the way that we are in places together consciously. I think I coordinated the biggest visual art program that Wide Open Space has ever had that year – might be wrong about that but we had more funding than usual from elsewhere that we decided to channel that way. Well, every year I renew my vows to art as the greatest way of knowing that we have within modernity, although like any great love it’s not without its flaws. So Watch This Space given its smaller scale/DIY approach to facilitating and producing aesthetic experiences and collaborations allows much more experimentation, discussion of failure, gentle moments of beauty, humble approaches to being together in art. WTS is a critical constituent in people’s introduction to Central Australia, hosting what they might find. We should remember that more. Full-on question. Well I’m back here in Mparntwe Alice Springs still stitched into the textile of the place maybe permanently on some level, as much as we can b. Still making art and supporting exchanges, still feeling like maybe it doesn’t suit me and I should pursue something with more inherent stability but aware of the illusion of that. On track to crazy aunty status but got no nephs or nieces so kind of still get to sit at the kids table. At the moment I’m trying to work out somewhere in the world to go to get a little perspective and thinking about the wild possibility of this mobility and how to construct meaning in modernity. Let me count the ways. One Two Seventy Five measureless. There are many artist run spaces around in different places. This one responds to being in this place and all the layered complexity of that which unfolds over time. As it unfolds over me in time, Watch This Space remains a venue for people to intersect and make exchanges around that. Art is the body or focus point around which those exchanges are constructed. Kieren works across a broad spectrum of roles and capacities including creative producer, community cultural practitioner, strategist and curator to create interdisciplinary projects inspired by history, language, human ecology, storytelling and cultural knowledges. When asked to tell us about her practice, Kieren responded: "Oh gosh, I’m at my most inspired when I can work in response to a place, site, context and community." She loves working with diverse communities and perspectives to create projects and programs that explore human connection, identity, storytelling and place. Kieren often finds herself contemplating the beauty of the project and whether the call to care or be inspired is "enough to move people to ‘act’." 4. Why did you apply for the Coordinator position originally? Was it what you expected? I don’t think I actually applied. I moved to Alice to help Ochre Lawson who is a Sydney based painter, to install an exhibition and after 2 weeks, I decided to stay. I got a job at the Alice Springs Correctional Centre and I went onto the WTS Committee. From there I somehow made it to being the Coordinator and I loved it. 5. How did you find working at WTS? Was it different from arts organisations you had/have since worked for? I loved working at WTS. It shaped me in ways that will forever make me a better person!! WTS was for me like discovering I had a family who loved and thought and worked and made art and everything in my life roll in ways I cannot describe. I felt supported to discover at WTS that I never felt in any other organisation. 6. What were some of your fondest memories at WTS? Some of my fondest memories – wow, where do I start! Sharing space with Sue Mcleod who was painting in the studio every day and the flow on from that – meeting and knowing Sue’s incredible family. Listening and learning from Dan Murphy. Probably one of the funniest memories was when we (the committee) decided to render the inside and outside of the building. Two days of being covered in concrete dust, lime and dirt later, my feet, my eyelids, my hands and even my ears peeled!! Hosting an exhibition from Elliat Rich which was my introduction to Elliat’s work. I was instantly in love with her brain. Discovering and sharing an office space with the infamous Alex Kelly strategist and change agent who made me realise that I had skills! 7. Tell us about your greatest achievements during your time as the Coordinator. I was super proud of taking WTS from $25k pa to $50k pa and then we received Strategic Funding for Shifting Ground and none of us had even heard of that funding.. I am most proud of the Incubator and Shifting Ground projects. Both projects were in 2007. The Ideas Incubator launched an ideas space and network where professionals from a range of disciplines could collaboratively investigate how the arts can be used to re-imagine people’s lived relationships with ‘place’, ‘community’ ‘culture’ and ‘the environment’. 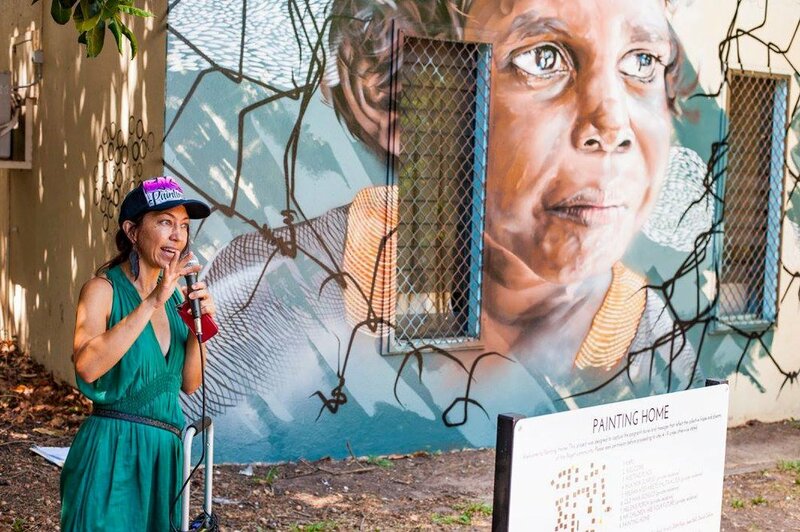 Participants had the opportunity to imagine, design and plan projects that gave expression to multiple local knowledge and new energy to the way public space was thought about, used and developed in Alice Springs. Shifting Ground – 21 days of Art and Performance across Alice Springs was a large-scale arts program that presented 58 local, interstate and international artists in Alice Springs. The program included visual arts, public art interventions, design, sound installations, music, spoken word, literature, performance and dance. All artworks were ‘embedded’ in and around Alice Springs across 13 venues, including empty shops, an abandoned quarry site, claypans, the Olive Pink Botanical Gardens, the Alice Springs Library book shelves, suburban laneways and the Airport baggage claim. A public program which ran concurrently that included 9 workshops and artist talks and 5 performance events, as well as 4 exhibitions in offsite spaces. Artist Talks and workshops facilitated discussions where audiences were able to engage critically with artists from varied disciplines. Their common aim was to link people to art, land and culture, responding to the arid lands on a physical, social and cultural level, telling stories of people and place and exploring sustainability and ecology. 8. In your eyes, what makes WTS an important organisation? The people in it. WTS supports artists to explore and experiment whilst holding space for them. WTS provides a supportive environment so that artists can expose themselves and be vulnerable. This is increasingly important. 9. Where are you now: geographically, work-wise, life-wise? I am still in the NT and somehow I ended up in Darwin. I went back to Alice a few years to do the Arts and Cultural Policy for the Alice Springs Town Council. Alice is a place that I am forever committed too so I think I will forever try to get back every now and again. 10. Has WTS contributed to where you are now? Jacquie is a feminist PhD student in Art History, English Literature and Philosophy. Her research centres on ideas of subjectivity through the lens of the maternal. Period as WTS Coordinator: "6 short months in 2007"
It was the year after I’d finished high school and I’d been attending Watch This Space exhibitions since I was a little kid. After working at Warlukurlangu, the art centre in Yuendumu, I’d decided on an arts career – I was going to study Art History/ Curatorship at ANU the following year. I was 18 or 19 and I think that being the coordinator at WTS appealed to me as interesting and glamorous. Looking back I don’t know really if I understood quite what the role meant, or required. I was, and still am, grateful for that opportunity. I didn’t have much to compare it with, and it was a long time ago. I think I loved it, but was overwhelmed at times. The committee were supportive and I remember cups of tea with Drew Moynihan being a calming influence. Since I have worked at a small commercial gallery, the National Gallery of Australia and now in the university system. None are similar to WTS, and none are better either. As a child, being amongst it all. Kids were always welcome, and in part I grew up with WTS. And the year after I left when Jade Bitar was co-ordinator. I volunteered with her that first winter I was back from uni, we had so much fun. Honestly I can’t think of any. I wasn’t in the role that long. Being so young and not screwing it up terribly felt like an achievement at the time. That it takes the cultural and intellectual life of Central Australia seriously. And its longevity is important too – there’s a genealogy of thinking and making that can be traced through Watch This Space, which I think is important to any community interested in its own specificity and self definition. Right now I’m a PhD student in the final stages of writing my thesis in Art History, English Literature and Philosophy at the University of Queensland. I live here in Brisbane and I teach in Art History at UQ and the Queensland College of Art (Griffith University). I don’t know what’s going to happen next. In so many ways. I grew up seeing challenging art there and now I’m an Art Historian (almost). Maybe more importantly though I think it helped found my feminism. It was a gallery established by women artists and in many ways my mother’s practice as an arts writer was honed on the work that Watch This Space did. Can you create an acrostic poem? Will you forgive me if I don’t? Jade has completed two Masters in Arts Curatorship at the University of Melbourne and Graphic Communication at RMIT in Melbourne. She is based in Melbourne and has worked in the arts for ten years in a range of festivals, galleries and Museums. I am originally from Alice Springs and was visiting my family over my university holidays. I heard about the role though a past WTS staff member and dropped in to Red Hot Arts to pick up an application form if only to read what kind of work the role would entail. I met some members of the board and they (without knowing) made me feel brave enough to apply. I was 22 and moved back to Alice Springs within a week and had no expectations and very little experience. It was wonderful that the Board took a chance on me! It was very different than anything I have done since and I still think very fondly of that time. People had a strong work ethic but also saw each other socially so there was a sense of working with your family. I felt empowered to have and execute my own ideas because there was a sense of openness and most of all, people were not precious; this is an invaluable trait in the Arts. Within my first few weeks beginning in the role, we opened the outdoor entertainment space and had a fabulous and crazy Christmas party. My Mum sewed tutu’s for everyone and it was a joint effort by all to make it a success. I smoked my first (and only) cigarette with Dan Murphy and had the best time. In general, I am very proud of the exhibitions we had over that year; the opening of Andrew Moynihan’s Lava Lava was a particular highlight. The show was executed flawlessly and the artwork was simple, yet accomplished. The show sold out and was one of the openings where everything was perfect. Lastly, meeting and working with Pam Lofts was very special. I cleaned out and painted the studio spaces and offices, a very big job which I felt it made a difference to the space. I curated a series of events entitled Four Spaces: A series of art, dialogue, music and film happenings which were well attended and created some interesting conversations around different artforms. I also made sure every artist was paid for every project we did that year. The year 2008 was when the Regional Arts Australia Conference came to Alice Springs; it was fantastic to be a delegate for the conference and am ambassador for Watch This Space. It is so important to have ARI’s like Watch This Space in regional Australia that have that quality and calibre of artists and arts workers supporting them. Specifically in Alice Springs, it is vital part of the Arts Industry because it bridges the gap between exhibiting in a commercial gallery or Araluen Arts Centre; it is the best middle ground. Watch This Space is also a fantastic place for interstate and overseas artists to connect into. Alice Springs is such a special space; all artist and arts workers would gain something invaluable in coming to meet the community behind Watch This Space and spend some time in Centre of Australia. I live in Melbourne and am the Exhibitions Coordinator for a city council, in this role I co-curate the local Museum and curate three gallery spaces within multi-disciplinary art centres. I also do regular freelance project work; an example of this was last year I was the Exhibitions Curator for the Gertrude Projection Festival and curated a solo show at Craft Victoria. I learnt invaluable things in that role, I come to Alice Springs regularly to see family and still follow all the artist’s and their work that I met over that time. I learnt quickly how much energy it takes to keep an ARI alive and thriving. There didn’t seem to be political or bureaucratic rhetoric which in retrospective is refreshing. People are genuinely inclusive and understand it makes for better programs and exhibitions. I believe I have taken these traits with me in my current roles; I hope that I am honest, hard-working and authentically communicative. Raffle tickets on sale now. 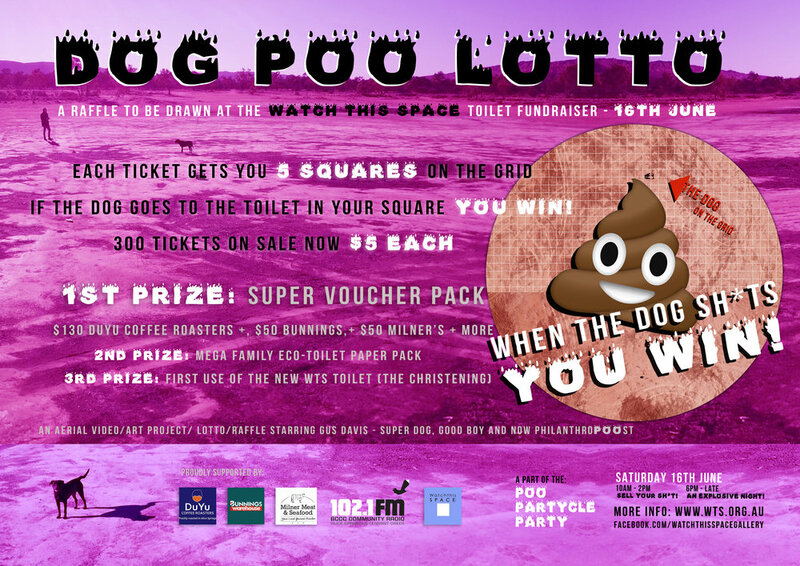 Each ticket will get you 5 squares on the grid - if the dog goes to the toilet in your square - you win! All proceeds go towards installing an accessible toilet at WTS. Get behind a K9-brown-pause for a very good cause! 3rd PRIZE: First use of the new WTS Toilet - The Christening of the bowl. The Dog business has been pre-filmed at the Claypans with a drone, turning the Claypans into a giant lottery grid. Number 1 good-boy, Gus Davis has gone number 2 in one of the grid squares - will your ticket match up with the lucky grid? The video will be playing on the night - tickets assigned to grid via excel randomized algorithm - each ticket will be assigned 5 squares. Raffle to be drawn at the Poo Partycle Party. A huge thanks you to Duyu Coffee Roasters, Milner Meat and Seafood, and Bunnings Warehouse. An aerial video / art project / lotto / raffle starring Gus Davis - Super Dog, Good Boy and PhilanthroPOOst. 8CCC will be broadcasting live from 9:30am-2pm at the Sell Your Sh*t Lawn Sale! Get ready to hear some sweet records spun by Potential Energy from 9:30am, then Mexicanosis from 11am, with all the Lawn Sale happenings mixed in there. Open mic is open to anyone and everyone between 12-2pm. This is a great opportunity for local musicians to perform to a live audience as well as get their talents broadcast live over the radio.